Burke signed with what he considers his "hometown team", Philadelphia, and Smith joined another pitching-challenged organization, Oakland. These are minor league opportunities now although doors frequently open for players to showcase their talent in major league spring training games. While thrilled to be in the Phillies organization, Burke is even happier to be healthy after having shoulder and hip surgery in two of the last three offseasons. "That's the big thing for me," the 33-year-old right-hander told The Philadelphia Inquirer. "I finally feel good in the offseason and can get some good work in preparing for spring training." Now using a submarine-style motion, the 6-foot-4 Burke was 5-1 with a 2.63 earned run average combined between Toronto's top two farm clubs last season. He came out of Duke University in 2005 and started his professional career that same year in the Atlantic League (Atlantic City), and has 80 games of major league experience with San Diego and the New York Mets, compiling a 3-6, 4.77 record. Smith, 34, has 50 appearances in the majors (1-0, 5.16) with Boston and Milwaukee, but has not been at that level since spending much of 2014 with Sugar Land, where his six victories without a loss (2.15 ERA) got him a fresh opportunity in the Padres system. He spent most of last year at Triple-A El Paso, going 5-7 with a 3.60 ERA in 22 starts. First baseman Brandon Snyder, who played one game at Southern Maryland last spring and has major league time with Baltimore, Texas and the Red Sox, hit .278 with 52 RBI in 93 games for Double-A Bowie, MD in the Orioles chain in '15. He has moved into the Atlanta farm system. In moves involving 2015 Atlantic Leaguers, York outfielder Shannon Wilkerson has re-signed with Minnesota after hitting .292 in 49 games for the Twins' Double-A Chattanooga farm club, and Arizona promoted Bridgeport infielder Ildemaro Vargas from a Class A roster to Triple-A Reno. 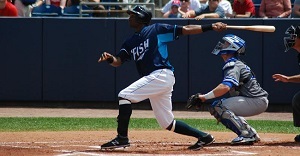 Wilkerson hit .256 with two homers and 16 RBI in 40 games for York while Vargas was .273-0-8 in 30 contests for the Bluefish. Two recent Atlantic League players are setting a hot pace in winter league play. Free agent Welington Dotel, the Player of the Year last season as a star outfielder at Bridgeport, continues to lead the Mexican League in both hits (65) and average (.376) and is tied for second with 17 stolen bases for 43 games. Another onetime Bluefish player, right-hander Kanekoa Texeira, leads the Puerto Rican League with five wins (5-0 in six appearances) and ranks fourth with an 0.86 ERA. Previously the chief spokesman for Commissioners Bowie Kuhn and Peter Ueberroth, Bob Wirz has been writing extensively about the Atlantic League and Independent Baseball since 2003.